Several research efforts, including one initiated by the Minnesota Local Road Research Board (LRRB), have suggested that rural intersection lighting reduces nighttime crashes and is a cost effective crash mitigation strategy. However, many Minnesota highway agencies do not routinely install or maintain streetlights at rural intersections or retain formal warrants or guidelines for installation. This study was initiated to evaluate the effectiveness of rural street lighting in reducing nighttime crashes at isolated rural intersections so that Minnesota agencies have more information to make lighting decisions. A before-and-after study was also used to evaluate the impact of lighting on nighttime crashes. 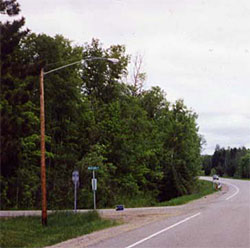 A survey was made of Minnesota counties to determine locations where lighting had been installed at rural intersections. Site visits were made to the majority of the intersections to collect geometric and surrounding land use data. A total 34 intersections were analyzed after removing unsuitable candidates from the list of potential locations. A reduction in the number of nighttime crashes was observed after lighting was installed at 44% of the intersections. At the same time, daytime crashes increased at 47% of the intersections. The nighttime to total and nighttime to daytime crash ratios also decreased by approximately 32% in the after period, representing a consistent decline in the number of crashes after lighting was installed. Both daytime and nighttime crash rate were calculated. The nighttime crash rate decreased by 35% after installation of lighting while daytime crash rate increased. The ratio of night crash rate to day crash rate also decreased. Poisson and linear regression models were used to determine the statistical significance at the 10% significance level. The decrease in night crash rate and decrease in ratio of night to total crashes were both statistically significant. The expected night crash rate in the before period was 54% higher than the after period and the expected ratio of night to total crashes in the before period was 15% higher than the after period. Additionally the expected day crash rate was 24% higher in the after period. This indicates that lighting had a statistically significant positive safety benefit. CTRE and CH2MHill are project partners. Rural lighted intersection in Minnesota.